In the email paradigm, there are two protocols always locked in a battle over who is better. 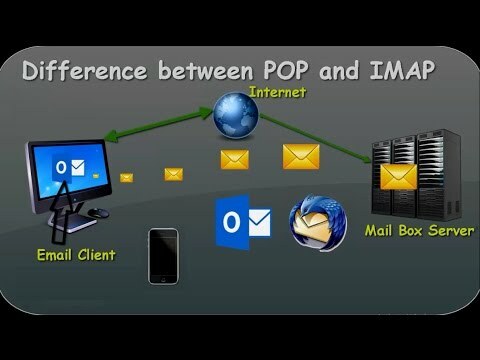 IMAP and POP3 are technology protocols that allow the download of email messages from servers and thus allow access to these emails via mail clients. Commonly used mail clients include Thunderbird and Microsoft’s Outlook. IMAP and POP3 allow users to access emails independently from browser portals. Many companies boast about one over the other but each holds disadvantages and advantages. This email protocol seems to be preferred due to its ability to allow email checks from various devices. This email access flexibility. Instead of being bound to one device, users can access emails from various devices like their computer, their cell phone, and tablet. IMAP (Internet Messaged Access Protocol) also dictates that the emails are stored on a server. Sent messages remain on this server, so these are also accessible from multiple devices. Further than that, IMAP syncs with the server so changes made in the desktop client, will be mirrored when the account is accessed through a browser instead. Companies often prefer this as it remains efficient because items are less likely to be duplicated or read repeatedly. Emails marked read, are marked on every connected device and the browser client. The largest setback is the reliance on internet connection. This protocol downloads emails from the server to one specific computer and then deletes the message from the server. Due to immediate deletion of downloaded emails, it may appear that some emails have gone missing when checking emails on other devices. When sending messages, messages are locally stored on the device, rather than a mail server. Although it is simple, it does allow multiple email accounts and servers to consolidate in one inbox. This not only saves storage space but it also allows the user to leave email copies on the server for more permanence. POP3 email is accessible regardless of internet connection and provides more of a sense of privacy for those who want to increase security. Each holds pros and cons yet it seems that users choose a protocol on a need basis. There are some companies and individuals aiming for high storage quota or the strongest security options. POP3 often demands configuring a phone forwarding system so that emails may be stored on the server post download. IMAP always requires an internet connection to proceed. It is difficult to categorize one protocol over the other; however, it is good to be knowledgeable on what each offers.